Mustard, a member of the Brassica family of plants, bears tiny round edible seeds and tasty leaves. Its English name, mustard, is derived from a contraction of the Latin mustum ardens meaning "burning must." This is a reference to the spicy heat of the crushed mustard seeds and the French practice of mixing the ground seeds with must, the young, unfermented juice of wine grapes. The condiment mustard is made from the seeds of the mustard plant. The seeds aren't flavorful until they are cracked, after which they are mixed with a liquid to become prepared mustard. 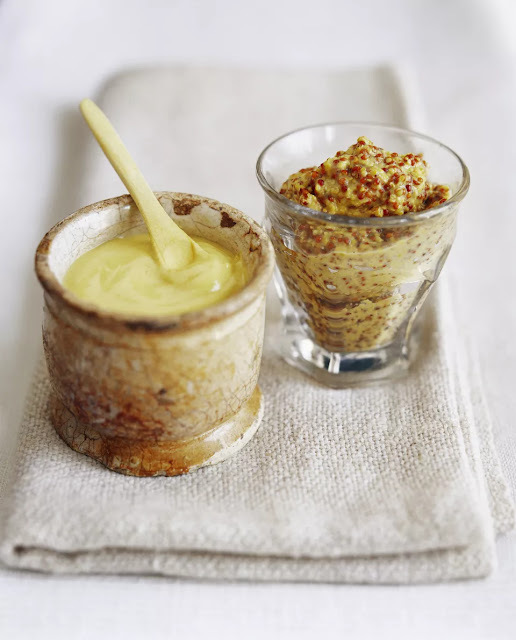 The culinary history of mustard as a condiment is extensive. In 1866, Jeremiah Colman, founder of Colman's Mustard of England, was appointed as mustard-maker to Queen Victoria. Colman perfected the technique of grinding mustard seeds into a fine powder without creating the heat which brings out the oil. We all know that losers and quitters can't cut the mustard (live up to the challenge), and perhaps the reason ballpark mustard is so popular is because pitchers apply mustard to their fastballs to get those strikeouts. The disabling and even lethal chemical weapon known as mustard gas is a synthetic copy based on the volatile nature of mustard oils.